Black Bear Lodge Blog: Thanks to our groups for a great week. Thanks to our groups for a great week. 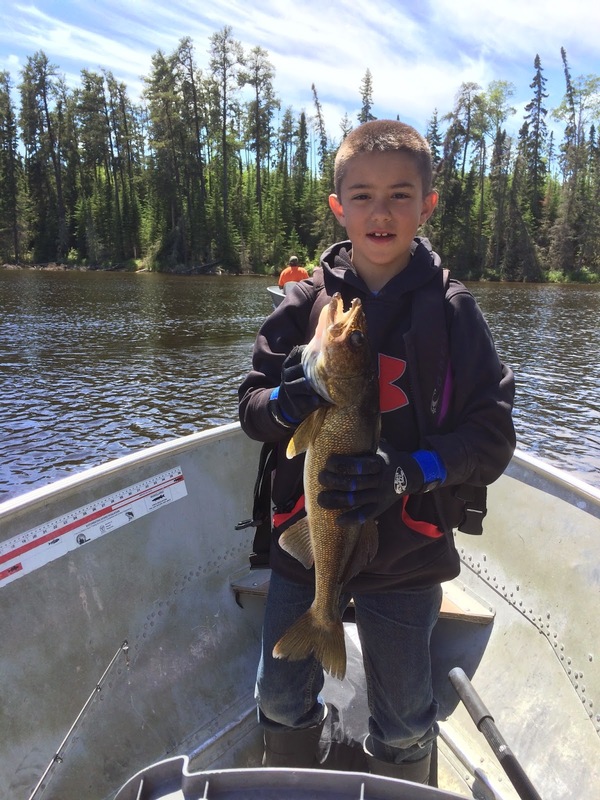 Biggest walleye(adult) - Paul B. - 27"
(student) - Eric B. 26.5"
Biggest pike (adult) - Brett R. - 35.5"
(student) - Bob R. - 37"
Biggest Trout (adult) - Bridget S. - 41.5"
(student) - Jordan N. - 39"
Even though the group did not get anywhere near their best ever total (4800+ fish), they caught lots of nice fish. There were many personal bests for sizes and amounts of fish. 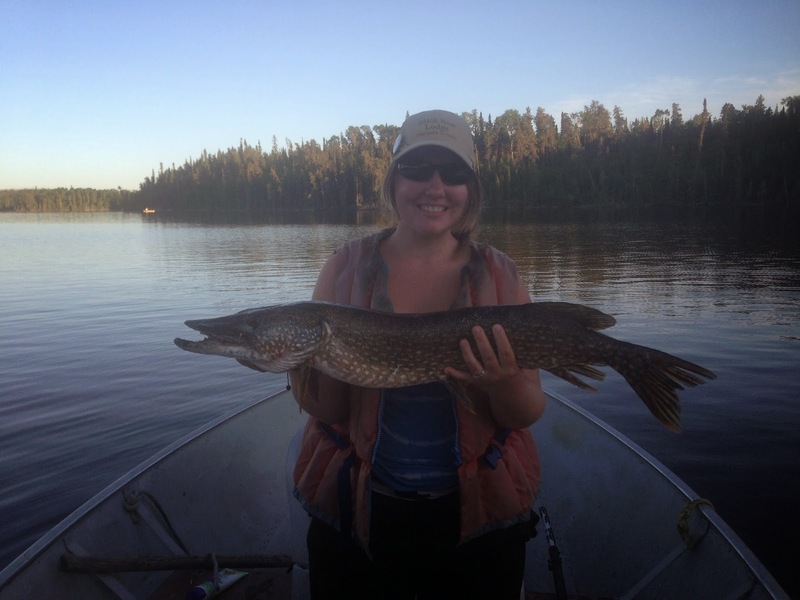 Including the monster laker caught by Bridget Spaeth. This 41.5 incher is (to the best of my recollection) the biggest trout ever caught by a female angler at Black Bear Lodge. It ranks right up there with the biggest of all time from our camp. I searched last year for the biggest ever trout from Black Bear, and the biggest I found was 42 inches. There was a picture of a 36 lb trout but there was no length noted. I will continue to search. 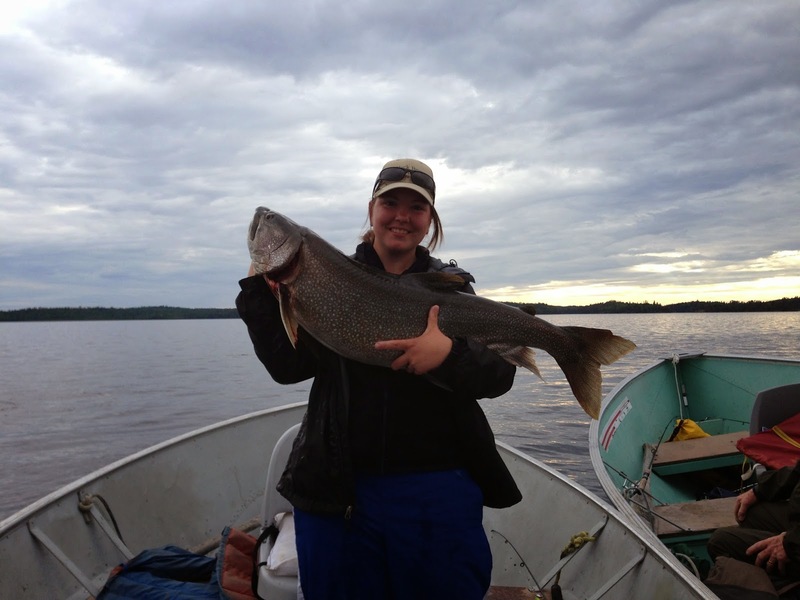 But for now, Bridget just entered a small elite group of fishermen/fisherwomen who have landed a trout over 40 inches. Way to go Bridget!! I would also like to give a big pat on the back to her brother and boat partner (Billy) who netted the fish for her. Also thanks to the many on-lookers and supporters who watched her land that monster fish and to help get it back into the water quickly. Great team effort!! Bridget Spaeth 41 1/2" laker!!!!! that fish was!!! It had to be pushing 30 lbs. get lots of different pictures of it!